Le yokozuna Harumafuji a eu chaud dans son combat contre le komusubi Kotoshogiku ! Le yokozuna Hakuho a conservé son score parfait pendant cette première semaine du tournoi de Nagoya grâce à sa victoire confortable sur le maegashira 3 Ikioi. Avec deux grands champions – Kisenosato et Kakuryu – déjà sortis, Hakuho (7-0) est resté robuste comme un chêne en frappant Ikioi (1-6). 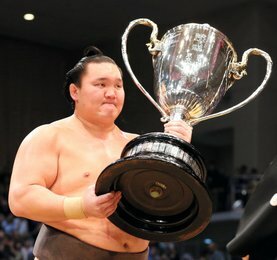 Hakuho n’est désormais plus qu’à deux victoires du record de victoires de Chiyonofuji. Dimanche, Hakuho affrontera pour la première fois le maegashira 4 Ura (5-2). Hakuho partage la première place du classement aux côtés du maegashira 8 Aoiyama (7-0). Le Bulgare a vaincu aujourd’hui Ichinojo et fera face demain à Onosho (5-2). L’autre yokozuna restant Harumafuji (5-2) a eu du fil à retordre face au komusubi Kotoshogiku (2-5). Kotoshogiku avait l’air de prendre l’avantage sur Harumafuji en repoussant le yokozuna jusqu’au bord de l’anneau mais le Mongol s’est accroché, il s’est retourné pour finalement prendre le dessus et envoyer l’ancien ôzeki à terre. 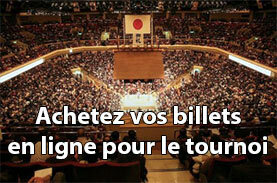 L’ôzeki Takayasu reste proche des leaders en remportant à sa sixième victoire consécutive en claquant au sol Shodai (2-5). L’autre ôzeki Goeido (4-3), a vaincu le maegashira 1 Takakeisho. 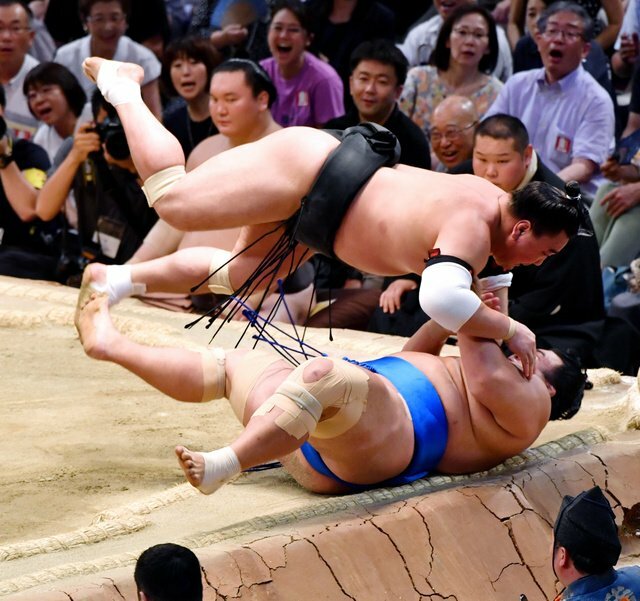 Yokozuna Hakuho kept his perfect record intact through the first week of the Nagoya Grand Sumo Tournament with a comfortable win over third-ranked maegashira Ikioi on Saturday. With two grand champions — Kisenosato and Kakuryu — having already pulled out, Hakuho remained sturdy as an oak, improving to 7-0 as he batted down Ikioi (1-6) for his 1,043rd career victory. 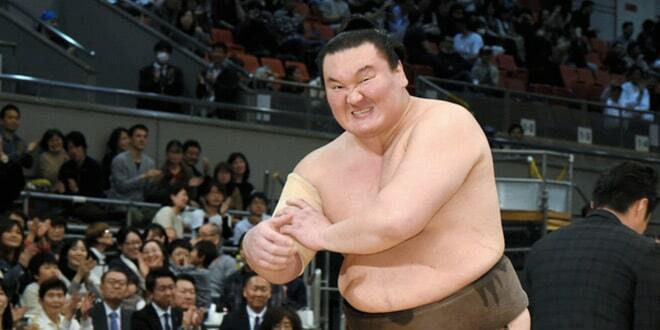 Hakuho is now four shy of former ozeki Kaio’s all-time record for matches won. 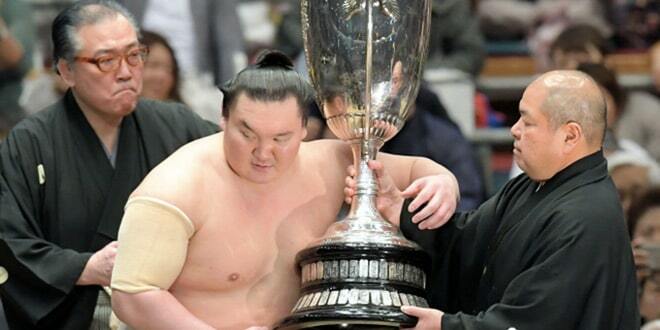 Hakuho is also two wins away from catching the late Chiyonofuji, who is second on the list. On Sunday, Hakuho will fight No. 4 maegashira Ura (5-2) in their first career matchup. 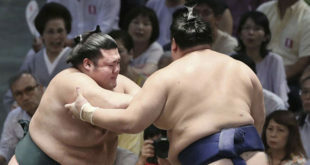 Hakuho shares the penthouse view with eighth-ranked Aoiyama (7-0), who shoved out sixth-ranked Ichinojo and will face No. 4 maegashira Onosho (5-2) on Sunday. The other yokozuna remaining at the meet, Harumafuji (5-2), was made to work for his win against komusubi Kotoshogiku (2-5), who owns a 32-29 career record against the Mongolian. Kotoshogiku looked like he was bound for another victory over Harumafuji, forcing him to the edge of the ring. But Haruamfuji hung on, and turned on Kotoshogiku to send his the former ozeki toppling off the mound. Ozeki Takayasu rolled to his sixth straight win after losing on opening day, slamming down top-ranked Shodai (2-5) to stay within touching distance of the leaders. The other ozeki left in the field, Goeido (4-3), defeated No. 1 Takakeisho, who has won just once at the meet.